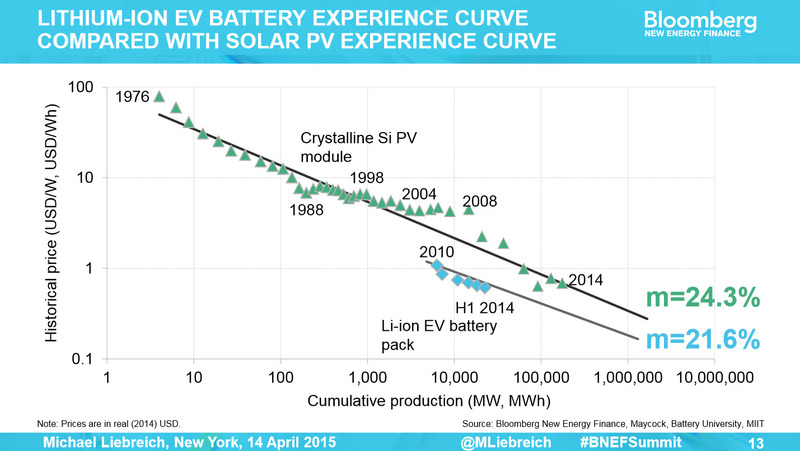 The experience curve for Li-Ion EV batteries shows a rapid rate of price reduction. There are some pretty optimistic numbers coming out from analysts for the cost of Lithium Ion batteries in the not to distant future. It is looking likely that they will drop from today’s $500+ / kwhr to below $200 / kwhr by 2020 and $160 / kwhr by 2025. 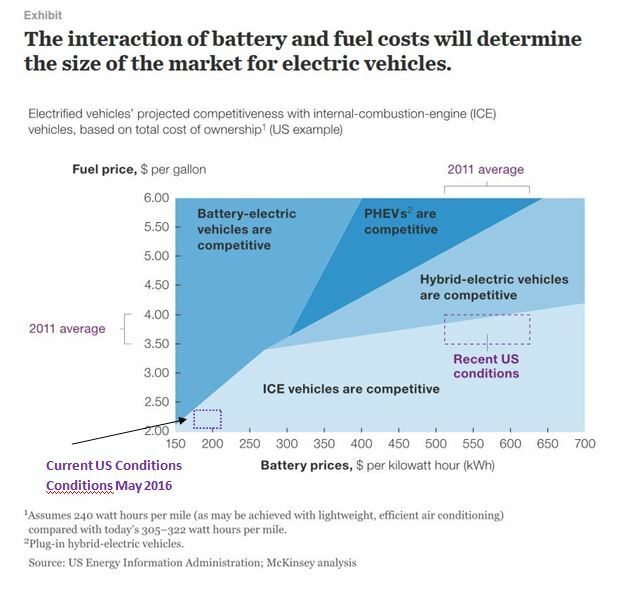 Using the experience curve in the link above, assuming a 30% annual growth rate for EVs, adjusting for more recent battery cost data data and then using the less steep learning curve associated with consumer electronics, we come up with $100 / kwhr by 2029 and $50 / kwhr by 2034. McKinsey, Navigant and Elon Musk’s projections get us to the $160 / kwhr and I have done the additional extrapolations. UPDATE: August 2018: Cost of batteries under $200 / kWhr HERE. UPDATE: May 2016: Cost of batteries down and gas prices up. New spin of the McKinsey graph – See below. UPDATE: October 2015: GM Claiming $145 / kwhr batteries beginning 2016 HERE. Note, this is cell cost not fully assembled battery pack. However current news coming out of GM and Tesla strongly suggest that my prediction of $100/kwhr which seemed optimistic 2 years ago, was actually conservative and it appears we will reach that benchmark much sooner. UPDATE: October 2014: Now experts are openly talking about $100 / kwhr in 10 years. Most Recent modified version of the McKinsey graph showing May 2016 conditions. 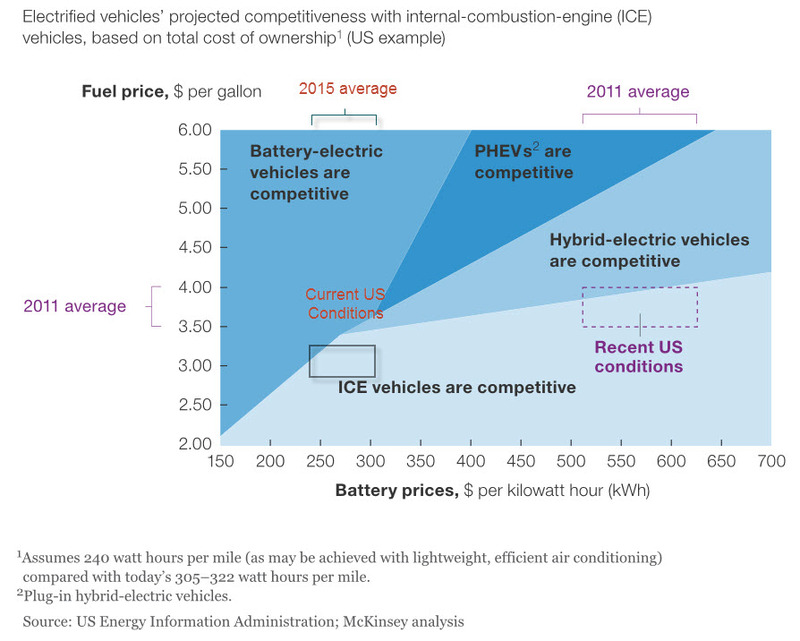 UPDATE June 2015: Plot of EV competitiveness reflecting collapsing battery prices and firming gasoline prices. The current conditions are reflected in the rectangle at lower left in the graph above. Lithium Ion Experience Curve Further cost reductions may be achieved through repurposing the batteries after they are depleted and their capacity to weight ratio is insufficient for transportation. See this link for post vehicular grid storage. This may also end up being a real problem for the flow battery folks. Even though their solution may be better, this may give Lithium Ion and its successor technologies the edge through scale and learning curve benefits. * Near term Nissan is taking a loss. However there is currently little demand for replacement batteries. It is a near certainty that they have priced this so that when demand becomes substantial it will be break-even or profitable. 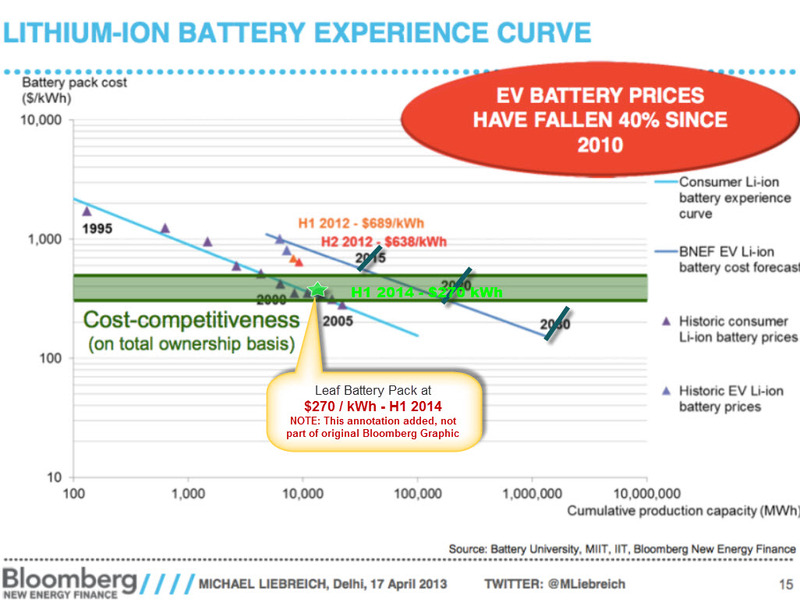 Another article predicting cost declines in Lithium Ion technology. This entry was posted in EV PEV, Exciting Technology Breakthroughs, New Energy Paradigm, Path to a New Paradigm and tagged economics, Electric Vehicle, Energy Storage, EV, PEV, Pluggable Electric Vehicle, Storage, Tesla. Bookmark the permalink.